BELIZE CITY, Wed. July 22, 2015–For the second year in a row, Katie Usher has decided to bring together fellow artists at the Image Factory on North Front Street, Belize City, as a part of what began in 2014 as a 48-hour lab, but this year, her project has taken on a life of its own – expanding now into its second week as she highlights the work of Kareem Clarke, the young Amandala reporter who was callously gunned down shortly after midnight on Monday, July 6. “In my opinion, artists and journalists are the same; we are telling stories to society…” said Katie, whose art project has been capturing a salient story: the state of homicides in Belize in 2015. It was the story of Kareem’s loss which motivated Katie to dedicating much of her project to Clarke. Her first wall featured the names of 78 persons who had so far suffered a violent death since 2015 began: Charlie Espat, 2; Travis Polanco, 6; Kijel Young, 19; Luis Campos, 26; Elroy Ramirez, 30; Kevin Flowers, 40; Egbert Hemmans, 55; and John Smith, 61, were among the murder victims listed. “A lot of people told me: ‘I knew a lot of people got killed, but I didn’t know it was so much,’” she mentioned. Persons who came by to see the project in motion were amazed at the number of persons who filled the wall, and they each were connected to so many others in Belize: they were somebody’s son, nephew, boyfriend, husband; somebody’s loved one. The names filled an entire wall; and it appeared to her that the choice of victims was “haphazard… purposeless” with ages ranging from very young to very old, although unfortunately, many of the victims were young, black males—exactly the profile which Kareem fit. Katie felt, though, that Kareem could not just be a statistic, and so the focus of her remaining project was on him. “He wrote many of the articles [reporting on the murder victims on the wall], and so to me when he ended up on the list, it was just unthinkable and unspeakable and I had to do something about it,” the artist added. Next, she turned to her mom’s treasured copies of the Amandala – the nation’s leading newspaper, and began clipping out the articles under Kareem Clarke’s byline. There were over a hundred – she estimates perhaps 200 – between February and July 2015, when the journalist was murdered. Yasser Musa, founder of the Image Factory, added his contributions to the project last Friday, and dubbed it, “Feed Read” – in which he features books and paintings from his personal collection, and a poem written on the wall. 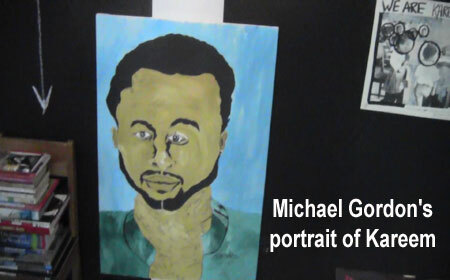 Michael Gordon painted a portrait of Kareem as a part of the lab and added it to the wall. A ream of blank paper runs to that portrait, representing all the words that could have been said. 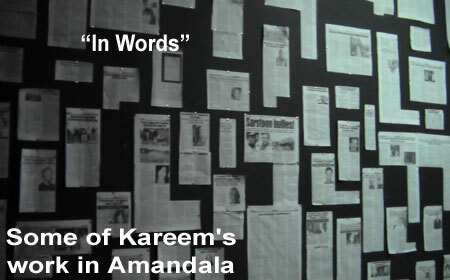 Those words which have found their way onto Amandala’s newsprint, then onto Katie’s wall will be collated in a journal which Katie hopes to present to Clarke’s mom, Julia Clarke, as a special gift. 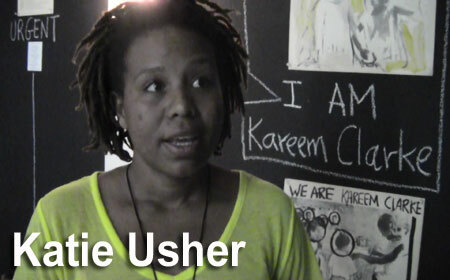 The idea, she said, came while speaking with other artists like Musa and Gilvano Swasey. “That will be my gift to her. His articles – February to July, compiled,” Katie pledged. The Image Factory is also undertaking a book drive, and the books donated for that cause as well as monetary gifts left in the donation box will be presented to the children of St. Joseph School when school reopens. “I am very excited about how the children will respond,” said Katie. Her project closes next Monday, July 27. At around 2:00 p.m. that day, Jamal Roots and Kyana Brindle are expected to unveil a surprise presentation at the Image Factory gallery.